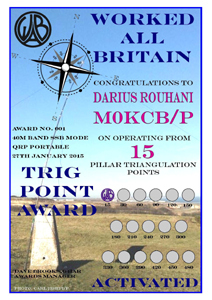 This award is based upon working the pillar type triangulation points (commonly known as 'Trig Points') which were used to carry out the surveying for Ordnance Survey maps. The requirements are outlined in the table below. 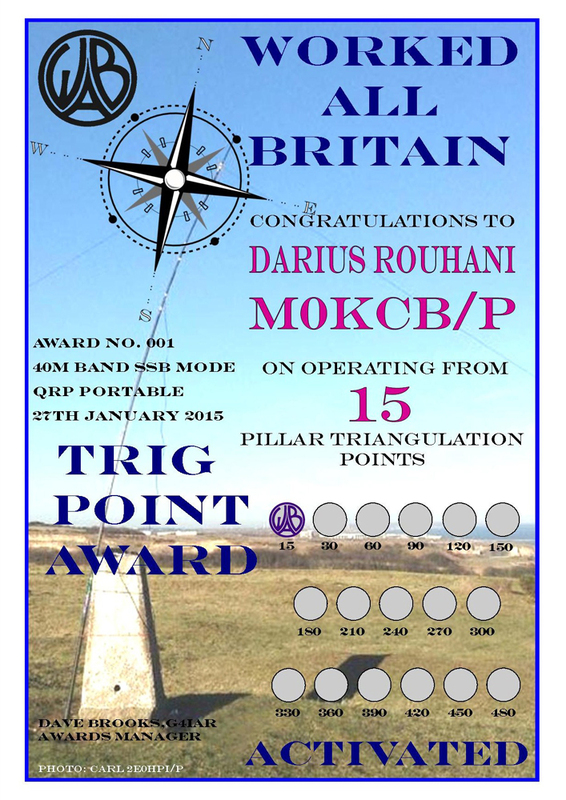 There will be six categories of award - HF Worked, HF Activated, VHF Worked, VHF Activated, "Trig to Trig" HF (Mixed HF/VHF claims count in this category) & "Trig to Trig" VHF (see below for "Trig to Trig" details). To be valid for the award, the activating station must be located within 30m of the pillar measured both horizontally and vertically. In common with all aspects of the other permanent W.A.B. 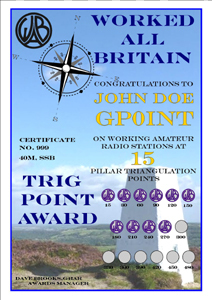 awards, a trig point may only be activated or worked once for credit towards this award. 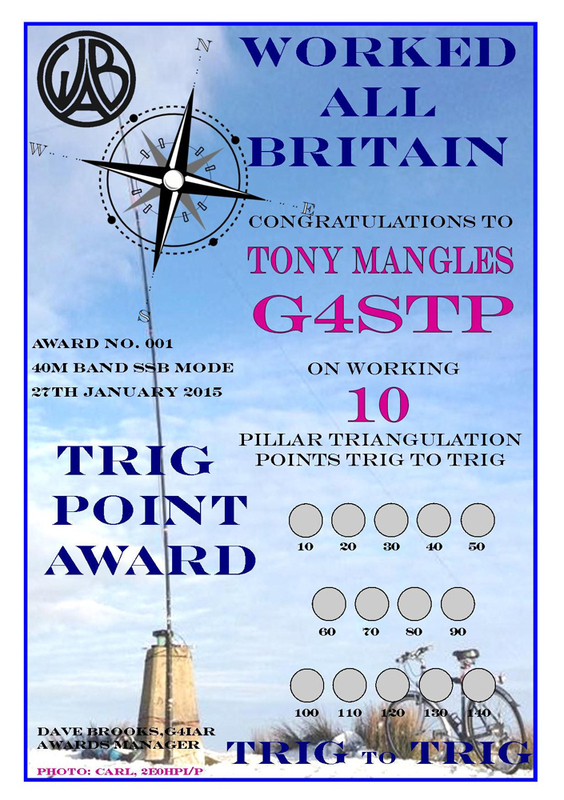 All contacts for this Award must have been made on or after 1st January 2015. The normal certificate price applies. For subsequent claims, previous claims must be included. Activators please note: The "Trig to Trig" categories are for working other trig points whilst activating from trig points yourself. Any "Trig to Trig" contacts will also count for your home collection if so desired. 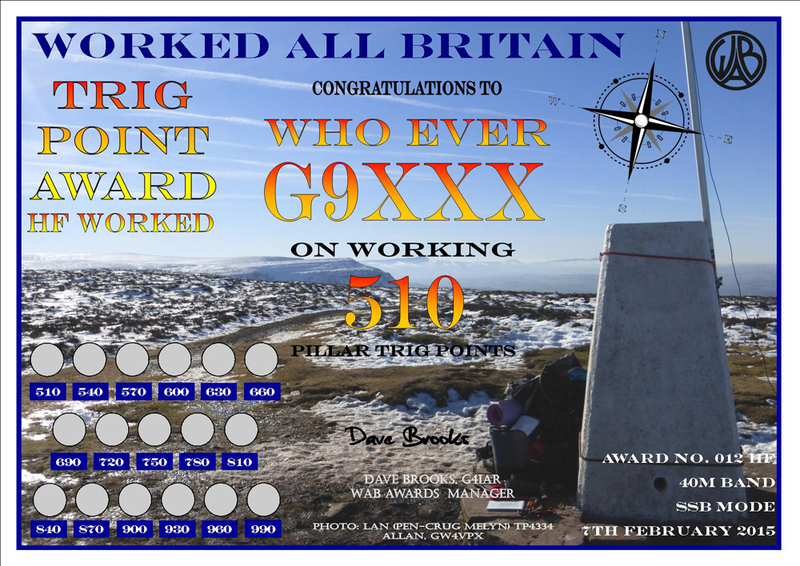 A trig point can only be worked once "Trig to Trig" for award credit, irrespective of which trig point it is worked from or who is activating the other trig point, i.e. 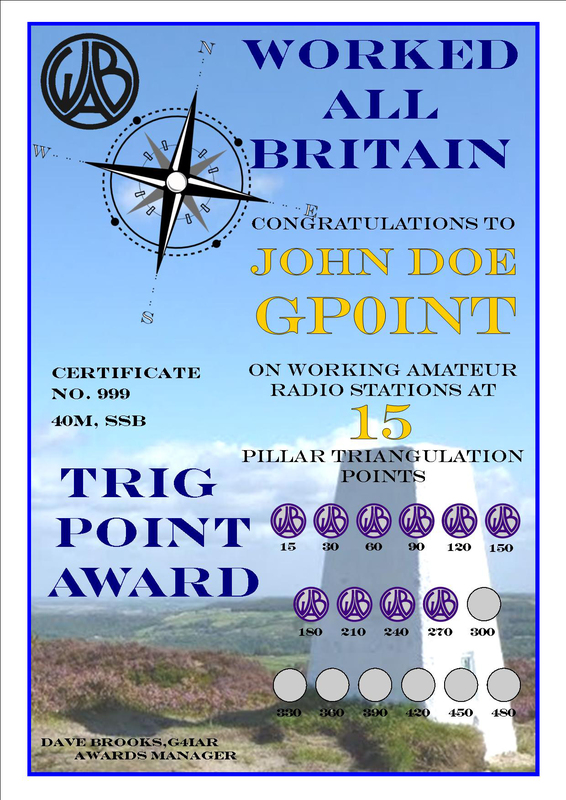 the same trig point cannot be worked again for further credit from a different trig point, nor will it count when worked if activated by a different station. "Activated" and "Trig to Trig" Awards are Free of Charge. The information used in compiling these trackers has been made available for use by the W.A.B. 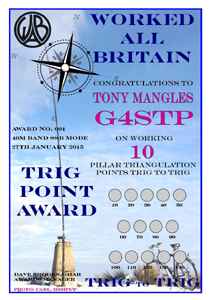 Awards Group by kind permission of Ian Harris of trigpointing.uk. This tracker and the data therein may therefore only be reproduced on the official W.A.B. CD and only be available for download from the W.A.B. website. W.A.B. cannot guarantee the accuracy of the list of Trig Points used to create these trackers, as it has been kindly supplied by an external group. You may find that a listed pillar has been totally destroyed or removed. You are advised that where possible, before a potential activation, especially those involving long or difficult journeys, research is done to establish that the pillar is still in existence. Please let us know if you find any that no longer exist.